We were recently inspired by dutch still-lifes and their attention to seasons when documenting their lives. Our new products are inspired by this idea of documentation and seasonal use. Each of our new products is designed to ensure it is useful always and holds purpose no matter when the seasons change! Our recent photoshoot features Spring, Summer, Autumn, and Winter all shot in California. Come visit us at New York Now! August 12th-15th 2018! Spring is a breath of fresh air allowing new life and prosperous futures. Located in Oakland California we celebrate the abundance of flowers, wildlife, and culture each time a new year rolls around. As a decorative element or a functional piece our new Pedestal Bowl will tie together any space effortlessly. Made of pure maple wood and pink cork these bowls are anti-bacterial and represent the power a single piece can bring to a room. We believe Summer is all about individuality and relaxation. 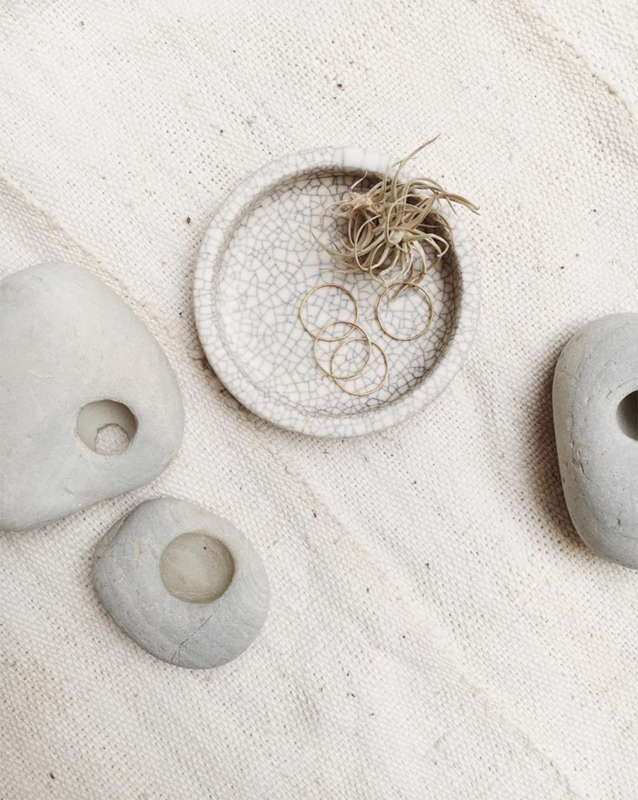 With ease and tranquility our hand made pieces promote simplistic intention. Each products holds its individuality near while allowing the eyes to rest easy. Being a time of warmth and rejuvenation Summer promotes relaxation. Our new Marble Cork Smoke Dish embraces this time of eases by pairing it's calming aesthetic with slowly moving smoke to mimic the atmosphere. This dish can also be utilized as a centerpiece or catchall tray. When the leaves descends slowly from the trees to rest easy on the ground we follow their lead of purposeful relaxation. With intention and repose our products make themselves known with ease and effort. Embrace Fall as a time of food, celebration, family, and friends. Each of our new Spoon Carving Kits includes all the tools needed to create a beautiful new piece for your home or an exciting new family tradition. Share a new adventure with your loved ones this fall and start carving! With low temperatures and breezy days comfort and warmth are essential. The warm color pallet and earthy materials of our products are enough to keep you grounded while simultaneously light and playful. 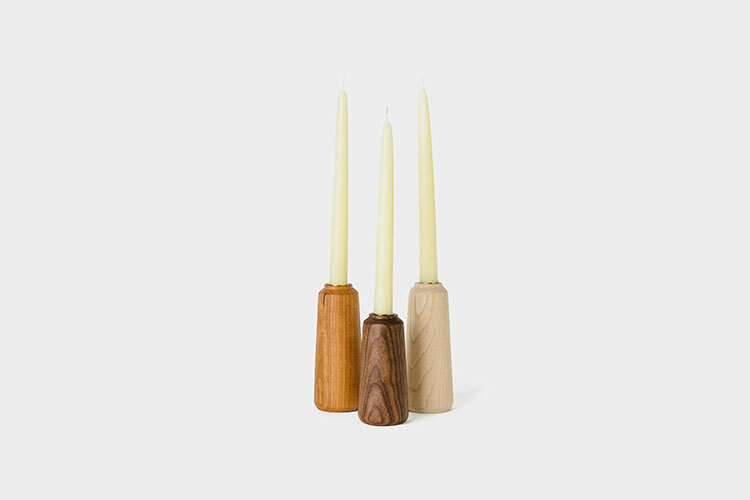 Foster a simplistic warmth with our new Candle Holders this Winter. Promote a romantic mood through a flame lit dinner or allow the pieces to sit simply and speak for themselves. However you choose to utilize these individually handmade pieces their elegance will light up the room. Are you excited about prop 64? So are we! Our Smoke Collection, including our marble cork smoke dish, wooden pipe, and globe incense holder is a celebration of the passing of prop 64! These three products emphasis detail and simplicity through the ease of use and visual harmony. Cork is naturally resilient to heat making the smoke dish perfect for incense or as an ashtray for your smoking herbs. 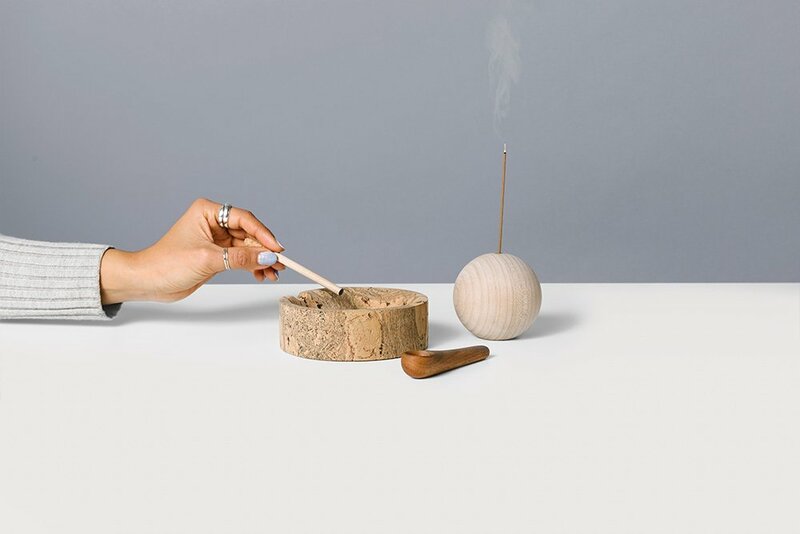 Our incense holder and wooden pipe reflect the calming lifestyle that prop 64 prompts. Utilizing marble cork as well as cherry and maple wood the collection visually mimics smoke through the light colors and simplistic lines and curves. Outside the Box, January 2018. The Bay Area is a urban gem that thrives on its rich culture, innovation, and design. With the goal of reflecting the history and diversity of the area in mind, our curated team of local designers began creating! We took the theme of “matter” alongside a recycled, reused or new material to create an object that represents the Bay Area as well as each designers personal aesthetic. All photography by Jeffrey Cross. 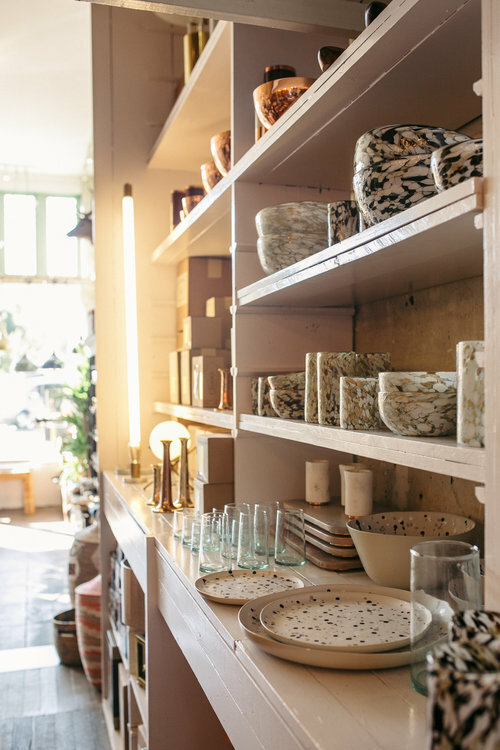 We have an exciting new selection of products available ranging from bowls to vases to canisters that are sure to catch your eye. Take a look! Charcoal cork and Walnut Bowl: Small, $55. Large, $79. These charcoal cork bowls with American Walnut Trims are hand-turned in Oakland, CA. Cork is a naturally antimicrobial and hypo-allergenic, making it an ideal material for food and plants. Each bowl has a hand sanded interior and is finished with a natural beeswax. Perfect as a planter or catch-all bowl. 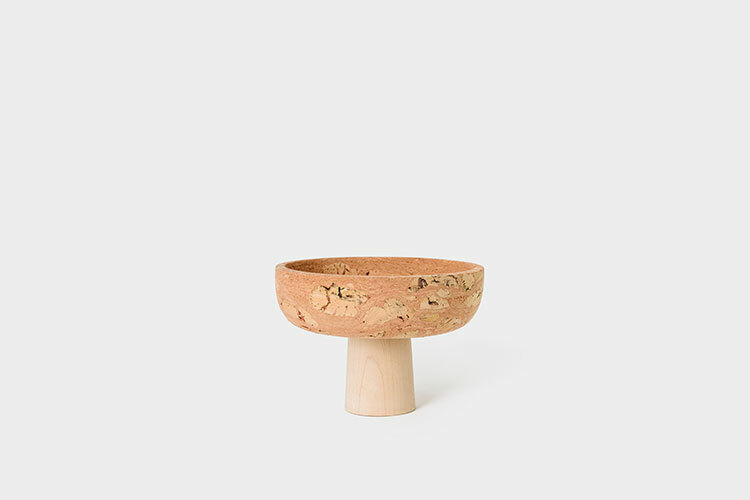 Cork Bowls: Tall Speckled, $80. Large Speckled, $150. Vintage Natural, $120. Cork is naturally antimicrobial and hypo- allergenic making it an ideal material for food. Each bowl has a hand sanded interior and is finished with natural beeswax. Can be used as a fruit bowl or catch-all bowl. Tall Maple Vase, $110. Tall + Wide Maple Vase, $125. 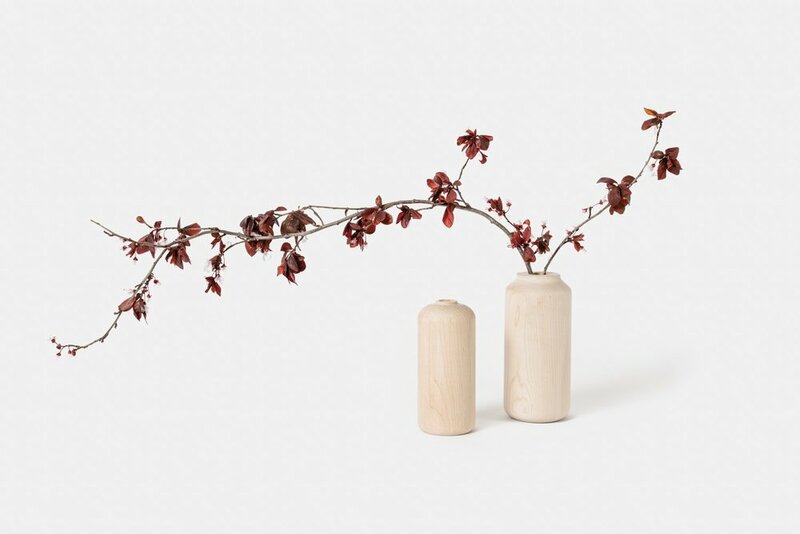 This one of a kind straight vase is made from a solid piece of hardwood. This wood was hand-turned and carved in my studio in Oakland, CA. Hand finished with mineral oil and beeswax to bring out the rich tones of its beautiful texture. Gorgeous with just a single flower or two, a glass vial is included with purchase for fresh flowers. Walnut Canisters: Small, $150. Medium, $175. Large, $200. 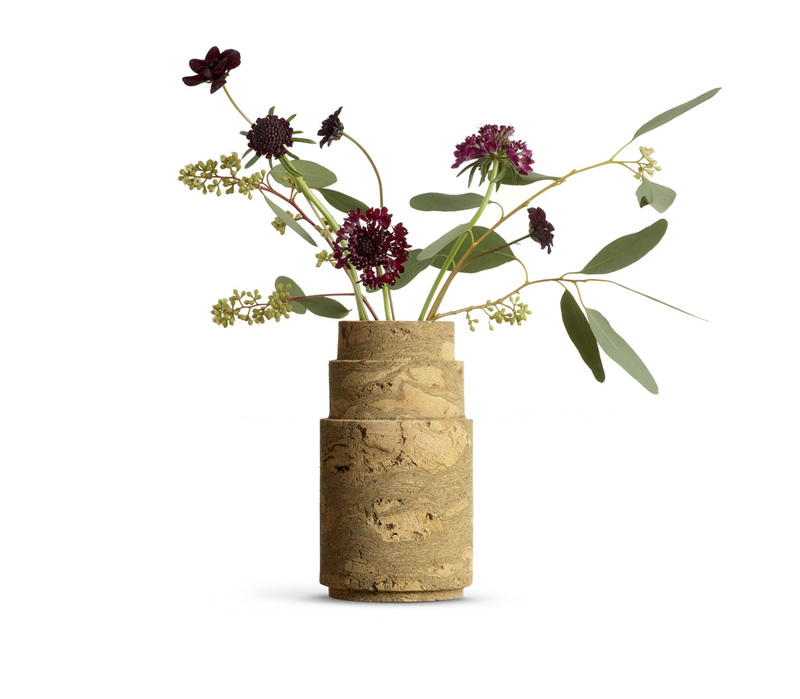 These cork and walnut canisters are hand-turned in Oakland, CA. 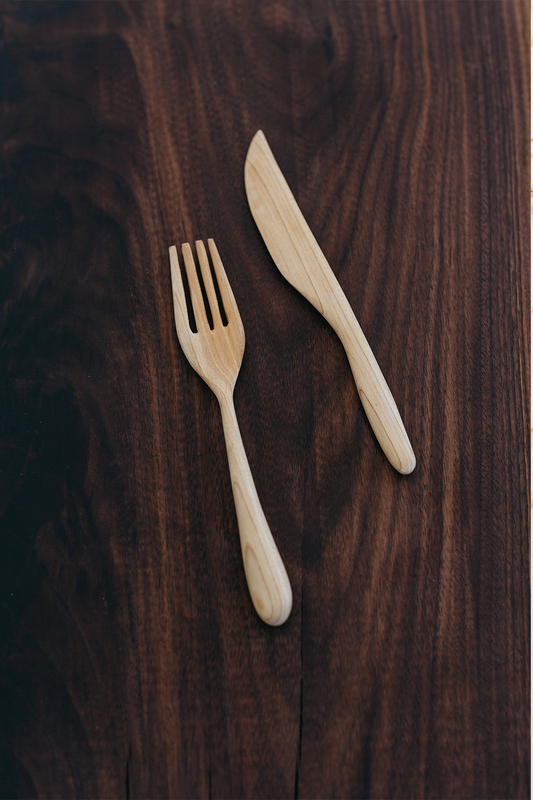 They are carefully made with hand selected hardwood from a local lumber yard and finished with a natural linseed oil and beeswax. Perfect for your favorite loose leaf tea, coffee or dry grains! Wow, wow, wow! We are so honored to be mentioned in not just one but FOUR magazines this month! Thank you to Country Living Magazine, Better Homes and Gardens, Sunset Magazine and Garden Magazine for featuring us. We were even named Top 100 Creatives of the country by Country Living Mag. Still pinching myself about this! In June, I put up an ad on Craigslist asking if anyone was interested in filming a couple of DIY carving videos for me. The Craigslist God's were in my favor because I was approached by Maya Pisciotto and Fabián Aguirre from motion picture company, The Understory. Their work blew me away (see their reel below! ), they had an amazing eye for detail and a beautiful aesthetic. I was delighted to have even been approached to work with such a talented duo for my project. We created 4 videos together that go along with my new book, Carve: A Simple Guide to Whittling. They took my idea and made it into a reality, one which was even better than I imagined! They, of course, were amazingly talented, but also very professional and fun to work with. In honor of being so inspired by these two, I thought it would be fun to do a little Q & A with them that shares their process and more of an insight behind their work. Enjoy the interview and don't forget to watch the DIY Video's we made together! The Understory Showreel from The Understory on Vimeo. 1. Why did you start working with film? FABIAN: I started out working in biology and conservation, but I always had a strong affinity for the visual and performing arts, particularly photography and film. Motion pictures allow me to bring science and art together in ways I never could have accomplished individually. MAYA: As a kid, my dad used to make up stories to tell me on long car trips and around the campfire. I was always fascinated by them and would always ask for another as soon as one ended (poor guy). I have also always been obsessed with making things - drawing, cooking, crocheting - you name it. I think I got in to working with film because it allowed me to have a hand in making a story and as a musician, it allows me to do many of the things I love in one place. Still shot from the Knife Carving Tutorial we made together. 2. What do you like about collaborating with artists? FABIAN: Taking on a project is a bit like going to graduate school each time— we immerse ourselves in the life and work of incredibly talented people and, with that, grow immensely. Filmmaking in itself is a collaborative process, but documentary-making in particular, provides us with an opportunity to learn from masters of their craft like you. I think we have one of the best jobs in the world. MAYA: The best part about collaborating with artists is that they make you approach a project differently than you might on your own. Being forced to think in new ways, in my opinion, is often what creates the most intriguing work. From their documentary, Living Refuge. 3. What is your favorite part of the process? FABIAN: As a cinematographer, I enjoy the process of capturing images most. Maya and I are fortunate in that we both do everything ourselves— like a tiny production powerhouse-- but she’s a much better editor than me, so I’m most comfortable behind the camera. On the other hand, seeing the story unfold as Maya cuts it is a very exciting part of the process. MAYA: I like everything about making films, but I especially like editing. It’s the longest part of the process and it can be tedious, but it’s the place where I get to be the most creative. I like the challenge of being given a bunch of pieces and having to figure out the most interesting way to put them together. From the film, Chasing Coral. FABIAN: I was hoping you wouldn’t ask that. Such a hard question! As with music, my taste is fluid, but I love documentaries, especially now that technology has been democratized and most people are able to make incredible (looking and sounding) films with a limited budget. I love all landmark natural history programs from the BBC (anything with David Attenborough or Professor Brian Cox), as well as documentary series like Chef’s Table. I’m not sure I can give you a favorite film, but if I had to choose one right now, it would be Alfonso Cuarón’s “Children of Men” given its current social, political and environmental relevance. It’s a poignant metaphor of our time. MAYA: I like too many films to have a favorite, but a few I’ve enjoyed recently have been Volver, Wolfpack and Chasing Coral - any film that swallows me whole and makes me think. I also love listening to stories on Radiolab, Snap Judgement and This American Life. 5. What is your favorite hiking spot in Marin? FABIAN: My favorite hiking spot in Marin, at the moment, is Tennessee Valley, especially near dusk. It’s an easy hike and provides a multitude of habitats representative of the region— from coastal prairie and chaparral, to oak forests, wetlands and, of course, access to the ocean. We often see owls, newts and snakes, bobcats and sometimes even whales and dolphins. MAYA: There are so many beautiful places to hike in Marin! I’m currently in love with Tennessee Valley, but Abbots Lagoon, Heart’s Desire , and Slide Ranch are close seconds. We Made Carving DIY Video Tutorials! Carve Book Tour and Workshops! Tickets go on sale this friday 7/28! Sign up to our newsletter below to get first access to tickets and events of the tour! First Access to Carve Workshops and Events.